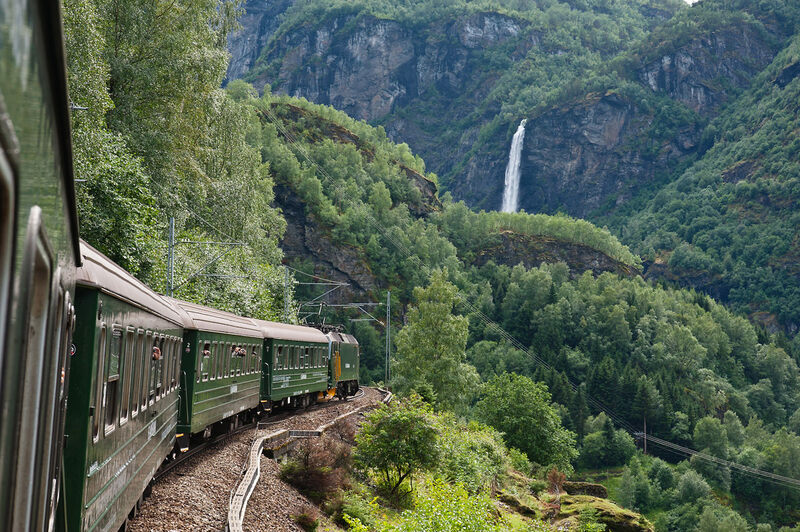 It sounded like something you should do once in your life: take the train on the Flam Railway in Norway. We thought we were very smart, we booked in advance through the cruise operator. Everything was very organised by us, my wife would get a special place on the train with her mobility scooter. 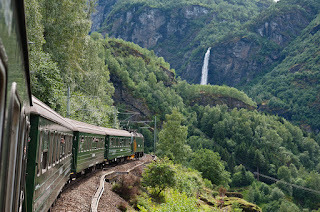 When we arrived in Flam, we got up in time. Quite an achievement for us, being very slow in starting the day. In time we left the cruise ship and went to the guides who were ready for us. A grumpy tall blond woman grabbed the papers from my hand that proved we had special seats. She growled that the papers were not right, there was no special seat for us. She kept the papers anyway. In exchange we both got a sticker with a number 24 on it. Behind us more people showed up. Some in wheelchairs, lots with walking sticks. They all got a sticker with the same number and we were told to follow the woman. We were led into a sort of corral on the platform, it looked like we were a row of sheep. The iron fences were meant to keep us apart from the passengers that were leaving a train when it arrived. My wife was told to leave her mobility scooter on the platform and walk to the train and climb on. With the help of another guide we managed to get her on and eventually seated. Behind us some of the other disabled people had the same struggle to get on board. Another guide, a young blond man, welcomed us and made a lot of jokes about things that could go wrong. When the train left, the more able passengers got up and immediately started making pictures of everything that we passed. Opposite us was a couple of which the man had a very professional looking camera; he was sitting next to the window. His wife had a small purple one and started to jump up and down whenever she saw something she liked. "You worry me", he said. She shrugged. On the other side a man with two walking sticks was seated with three women. One was very overweight and standing up all the time. She blocked most of the view of the man. He obviously was not able to stand up. He tried to peek around his wife but soon that was impossible because of the woman with the purple camera coming to stand next to the woman with the big bum. Once she came over to us and asked worried why we were not making pictures. "No need", my wife answered and the woman looked at us in disbelief and ran to the big woman again. Soon they were shouting to eachother: "Did you get that? Did you get that?" It proved harder than we thought to make decent pictures. It's only 20 miles and it also has 20 tunnels. This gave us the biggest pleasure of the trip: whenever the people thought that were making a nice picture, we would go through a tunnel. The driver heightened the fun by blaring a constant signal when going through these tunnels. It was a very high shrieking sound that hurted the ears. The comical guide came to warn us that the greatest spectacle was coming: a waterfall with a woman dancing in front of it. For us it was impossible to see this, but it sounded a bit fake anyway. At the end of the line the driver walked to the other side of the train and the people got another chance to win from the tunnels while photographing. Finally we got back at the station and wrestled out and went back to the faithful mobility scooter. While we walked back, out of the station, we came to the end of the train. Just in time to witness how a man in a mobility scooter drove off another carriage on the train with a ramp. We threw our stickers in a bin.